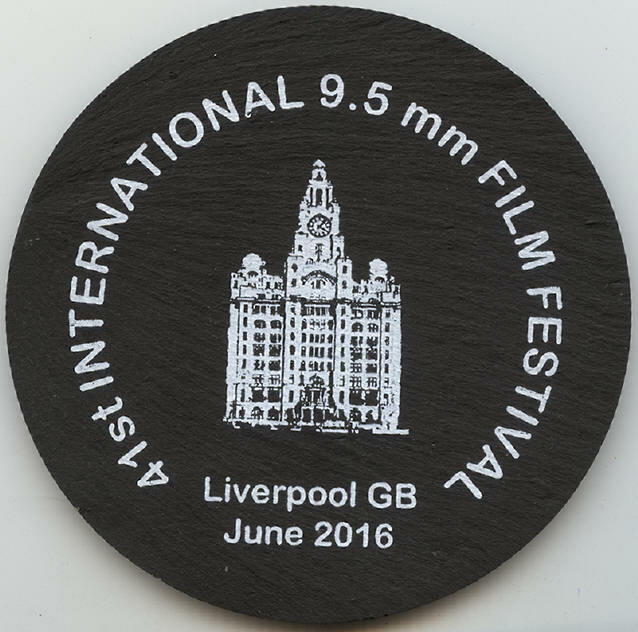 For 2016, it was the UKs turn again to host the '9.5 International' - sadly with the lack of fresh reversal colour film to use for filming, it was expected to be a lean year for 9.5mm film entries. Although much of the theme was around vintage times, there was a good number of film entries, even if they were from the past. Group 9.5 President Angus Tilston MBE had volunteered to organise this event, and chose the Merseyside area because not only was his home local, he himself had grown up and worked in the area and taken a great interest in the local structure and industry, still playing a major part in the local archives, involving much of local history on film. The event was held in the city of Liverpool, handy for air, road and rail access, and benefitting that the redundant docklands have recently been renovated and refurbished with modern hotels, shopping arcades and museums. 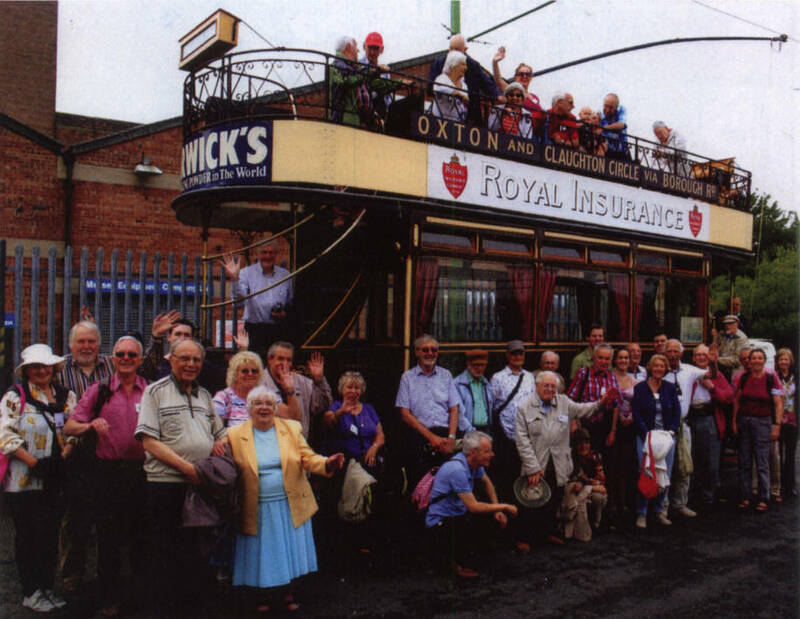 The Festival ran from Thursday 9th June to Sunday 12th June inclusive. 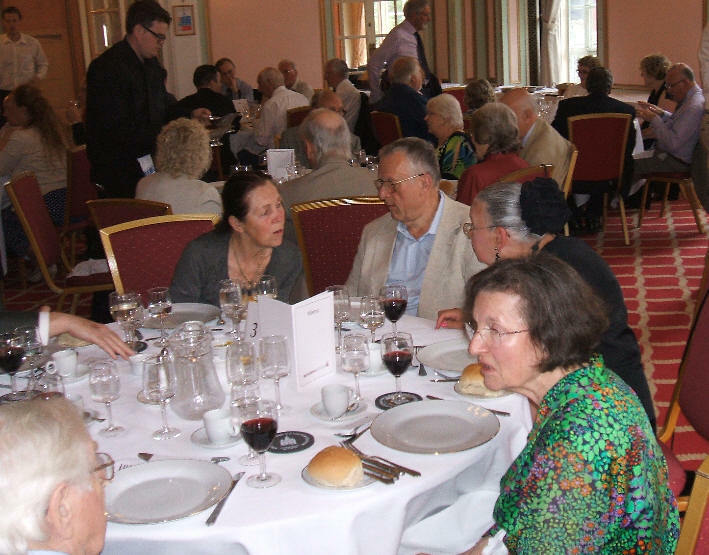 The Festival was attended by 43 people, 30 from the UK with others split between French, German and Dutch ninefivers. Liverpool is a city in decline, although the docks area has been massively rebuilt with the help of EU and government grants. Sadly with tourists, container and cruise ships avoiding the place, I fear for it's future, whilst all that money would have been better spent down here in the south to cope with the thousands of immigrants arriving weekly from all parts of the world through our southern ports. 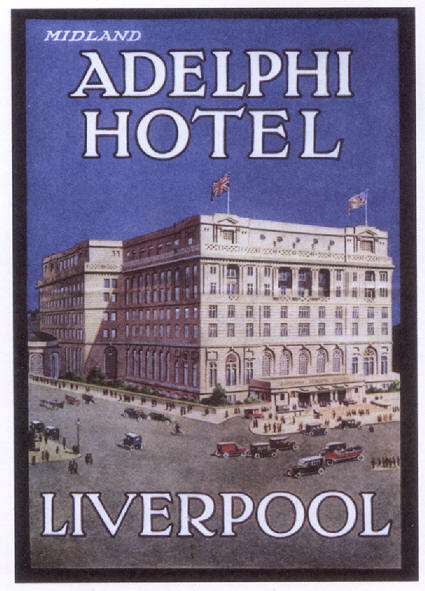 The event was held at the Adelphi Hotel, famous for its history of being host to the stars of cinema and theatre as they crossed between the UK and America in the golden days of the large cruise liners like the Queen Mary and Elizabeth. Churchill always used this hotel, other famous guests included Laurel & Hardy, Frank Sinatra and Bob Dylan. Roy Rogers actually rode his horse Trigger up the grand staircase! Having been left derelict by British Rail, with the top two floors open to the elements, it was taken over by a budget coach holiday set-up also running holiday camps, so perhaps not the best of venues which also sports a food hygiene rating of zero (yes zero!!). Howver despite the melee at mealtimes, by the consumption of a decent quantity of red wine, my partner Anne and myself seemed to have survived! During the Festival, a number of visits were arranged. 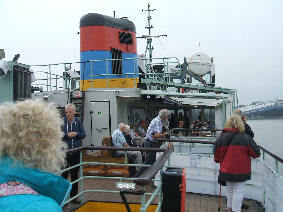 On the first day, guests took the ferry across the Mersey (there's a song there somewhere! 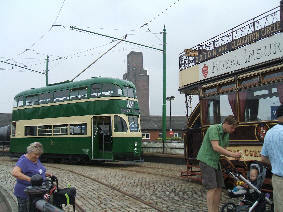 ), with a vintage tram ride and a visit to the transport museum (including an excellent buffet lunch). We even managed a short run on the new Liverpool Metro underground rapid transit system! 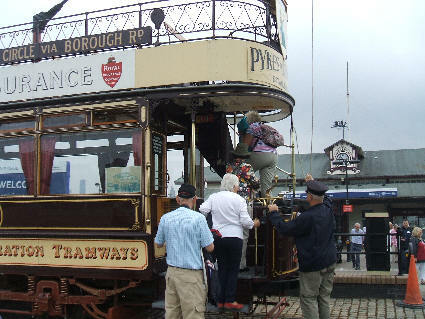 At the transport museum - with a ride on the tram! The complete contingent for the 2016 International! 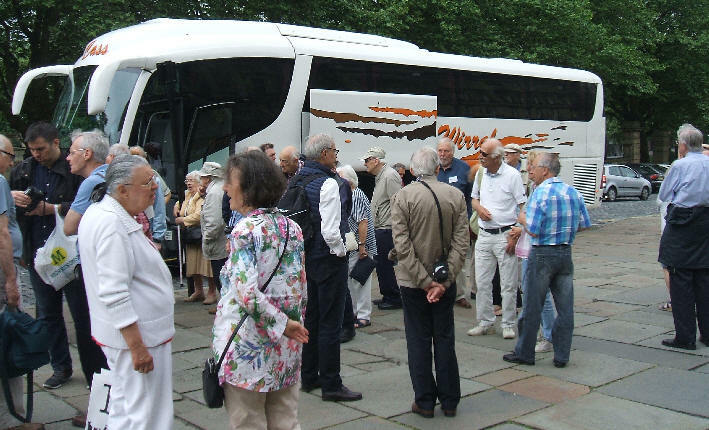 The next day featured a guided coach tour of the city. Finally there was a special fish-and-chip lunch served in the new skyscraper tower Panoramic Restaurant at 300 feet / 100 metres above the city. 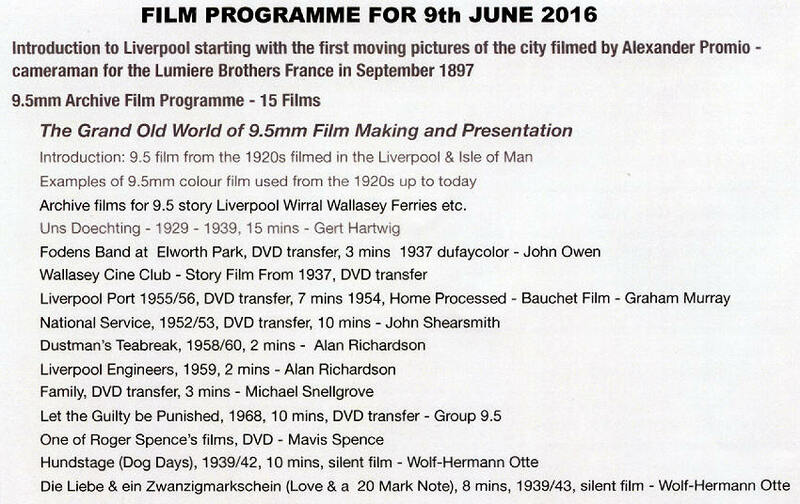 An interesting selection, many actually filmed on the 9.5mm film gauge by those present (although some sadly unable to attend because of ill health or death). 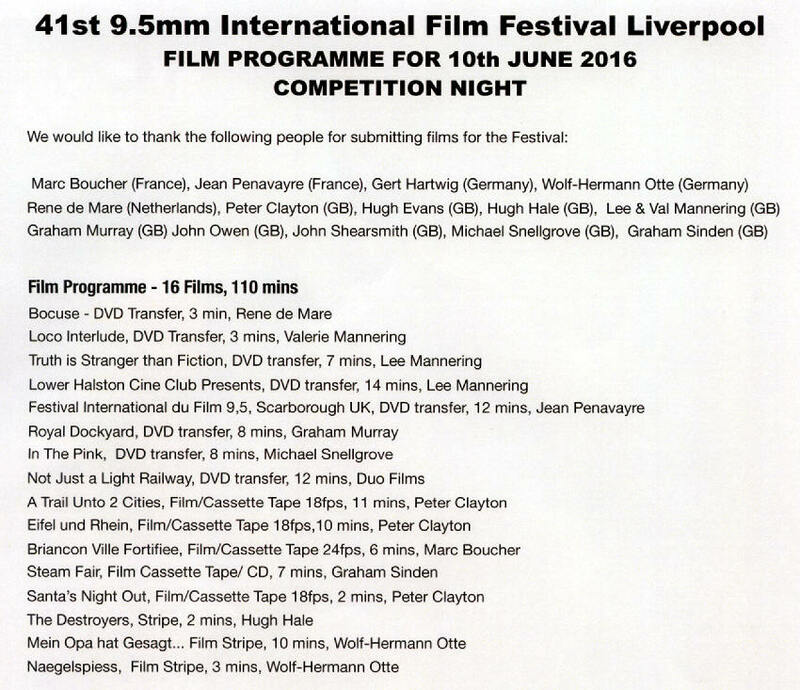 Whilst not part of the actual film competition, held on the following evening, there was an audience award, which was won by Graham Murray for his 9.5mm film of the Liverpool Port from 1955/56. There were a good number of entries for the competition, many actually entered as DVD transfers, which these days does make for easier and safer exhibition! One or two intended entries were actually digital efforts - nothing to do with our 9.5mm gauge, luckily none won prizes, but this does need to be addressed in any future 9.5mm competition. There are one or two other competition areas for digital work but not at a '9.5 International'! I myself had dug up an old 9.5mm film I had made in my teens but suggested it be withdrawn, as were a number of others, purely on a time basis - us oldies couldn't sit up to midnight each evening! 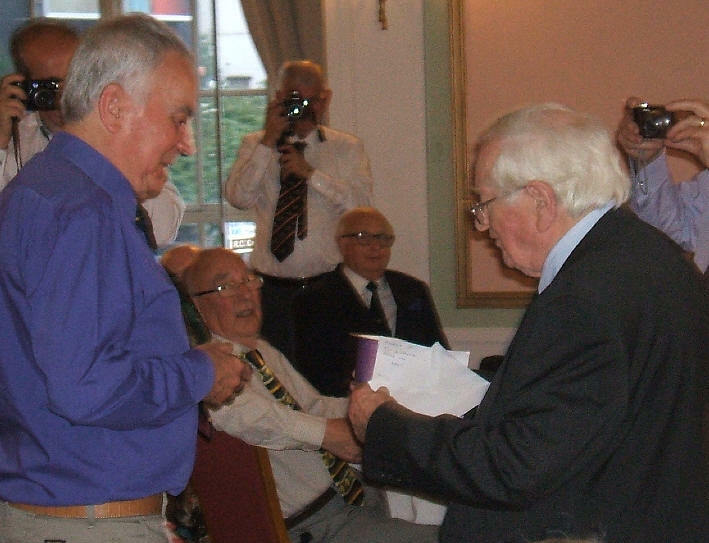 The judge announced the winners after the dinner on the Saturday night. In first place was "Santa's Night Out" from UK Group 9.5 member Peter Clayton. A lovely little animated film using coloured paper cut outs. 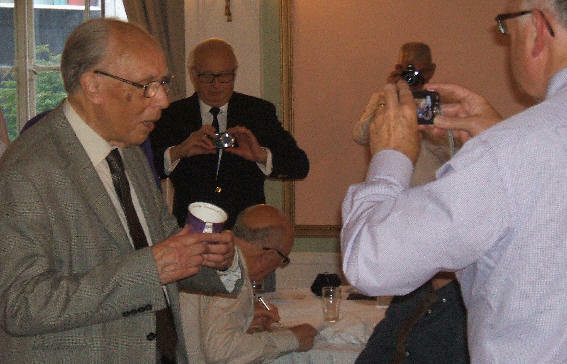 Second prize went to "Naegelspiess" from German 9.5 club member Wolf-Hermann Otte. 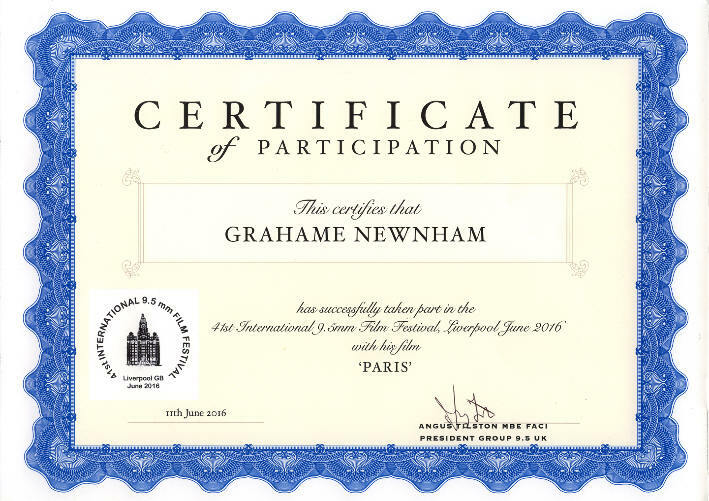 The audience award went to our UK Group 9.5 club ex-Chairman Graham Murray for "Royal Dockyard" an interesting history of the Chatham location. 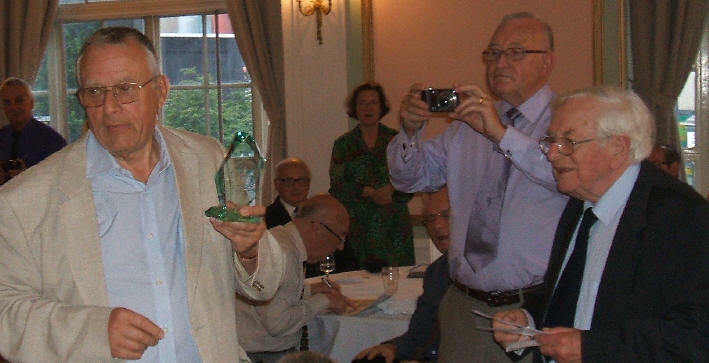 The winners received an attractive trophy together with a Queen's 90th Birthday souvenir mug plus a bottle of red wine donated as usual by myself (well Presto Films). Sad that many entries were quite old, often filmed in black & white, but a few were filmed within the last year or so (like "Steam Fair" from Graham Sinden) which demonstrated the superb results obtained from Kodal 100D and Fuji Velvia E6 colour reversal film stocks, now no longer available. Well my vintage 9.5mm film from about 1962 was filmed on my Dad's school trip to Paris. (Eastney Secondary Modern, Portsmouth). I used a Pathéscope "Prince" cine camera and 9.5mm Pathecolour film (actually Ferraniacolour). I actually got a certificate!